Do you use videos in your marketing? Are you looking for ways to increase engagement and shares? 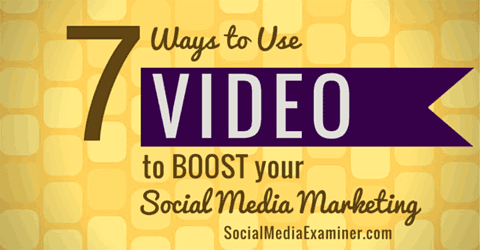 In this article you’ll find seven ways to use video to boost your social media marketing. Thanks to Tom Treanor for creating this article. 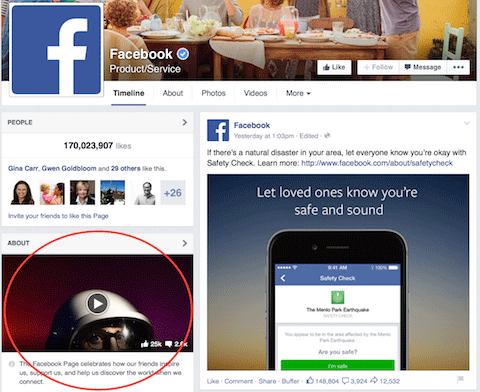 Facebook allows you to select a featured video that will appear in your page’s About section. Discover seven ways to use video to boost your social media efforts. To add a featured video, go to your page’s Videos tab (which is below the cover photo) and click Add Featured Video. Click Add Featured Video on the Videos tab. Then select a video from the list of videos you’ve uploaded. If you haven’t uploaded a video to Facebook, you need to do that first and then select that video as your featured video. Make sure the video you choose is a good representation of your business because it’s likely the first video visitors will watch. Add a featured video to the About section of your Facebook page. If you have a Facebook page for your software product, you can use a tool like GoAnimate to create a friendly explainer video. 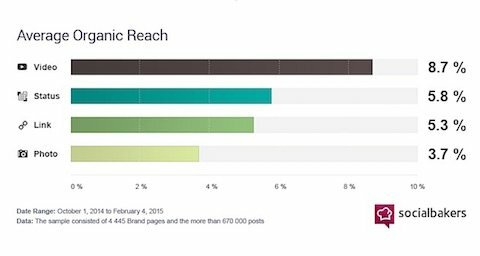 According to a Socialbakers study, video posts have the most organic reach of any type of Facebook post. Videos are the most effective way to reach your audience on Facebook. So an easy way to improve the reach of your posts is to include a video uploaded directly to Facebook. Consider creating a short video clip or video slideshow that reinforces your post’s content. If you have a YouTube channel, set up a channel trailer. This video plays automatically for visitors who are not subscribed to your channel. Add a trailer to tell potential subscribers about your YouTube channel. The channel trailer is your elevator pitch to potential subscribers. YouTube suggests you choose a video that’s short, describes your channel and encourages visitors to subscribe. Go to your YouTube channel and find the option to add a channel trailer (also referred to as an unsubscribed trailer). Click the Channel Trailer button, shown below. Click Channel Trailer and then select your video. Next, select your video or enter the video’s YouTube URL. Then click Save. Note: If you haven’t uploaded any videos, you won’t see the Channel Trailer option. In this case you need to enable the channel browse view first. 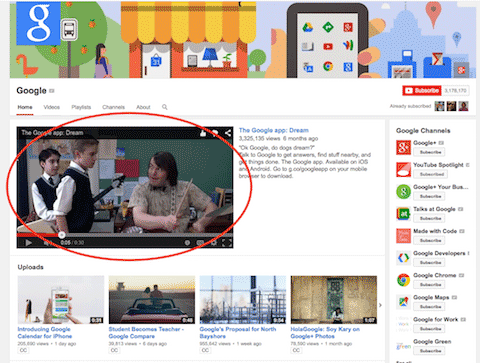 Hover over the section with your channel name and click the pencil icon that appears on the right. Select Edit Channel Navigation, and then in the dialog box, enable the Browse View and click Save. If you plan to upload lots of videos to YouTube, consider creating a personal video message welcoming people to your channel. Let them know what kinds of videos you will publish—for example, interviews, tutorials, funny videos, announcements or product reviews. If you’re not ready to create your own videos, you can still build a YouTube presence. Instead of uploading your own videos, curate the best YouTube videos created by other users into playlists on your channel. Build a playlist of YouTube videos that will appeal to your audience. Curated content is hot, and video is no exception. If you create a YouTube channel full of videos by top industry thought leaders, you’ll already have a subscriber base when you start posting your own videos. Do you have videos on your website? If so, take advantage of the open graph to get social shares of your pages to stand out on Facebook and Twitter. 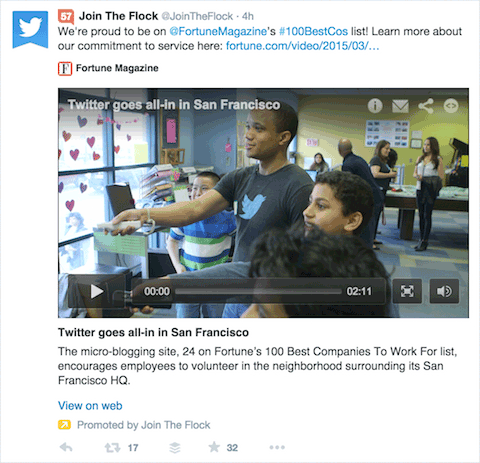 For example, look at this tweet of a page with a video from Fortune.com. The tweet includes the actual video under the tweet, as opposed to just a link to it. This tweet includes a video from Fortune.com. This media-enhanced tweet is created with Twitter cards, specifically the Twitter player card. You can see examples of this code in the source for YouTube videos. The code ensures that YouTube videos shared on Twitter will populate the actual video in the tweet. 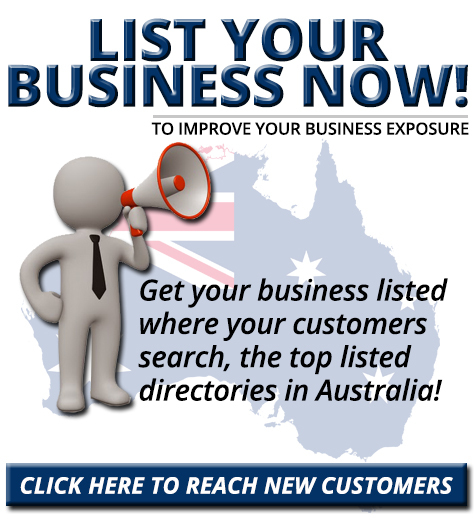 You can add similar functionality to your website or blog. This code ensures that YouTube videos will be included within the tweet. This code specifies that the video will be included in the Facebook post. This code ensures that the media element will be attached when sharing a video page from your website on social networks. The result is a social media post that will stand out in the news feed, more so than plain text or link updates. If you use the self-hosted version of WordPress for your website, you can utilize premium plugins like Yoast Video SEO for WordPress to optimize your video pages for both search engines and social media. With sites like Vine and Instagram you can upload short video clips to reach a different audience with video content. Although big brands often create high-production videos for these sites, it’s possible to stand out with creativity and basic equipment such as a smartphone and a phone stand. 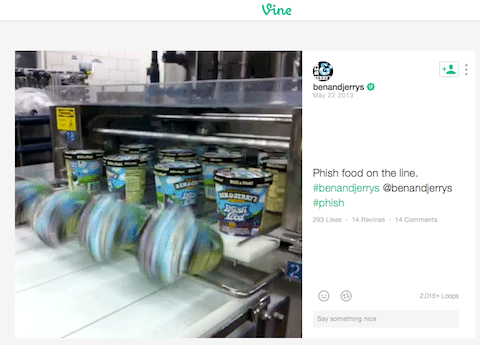 For example, the following Ben and Jerry’s Vine video shows how ice cream moves through the manufacturing process. With a short video, give users a behind-the-scenes look at your business. In 6 seconds on Vine or up to 15 seconds on Instagram, you can show people behind the scenes of your operation, demonstrate something useful or inspire them. Learn more about creating short videos for these sites in this post: 6 Ways to Use Short Video for Social Marketing. You can enhance your blog content and increase social engagement by embedding video posts on your website. 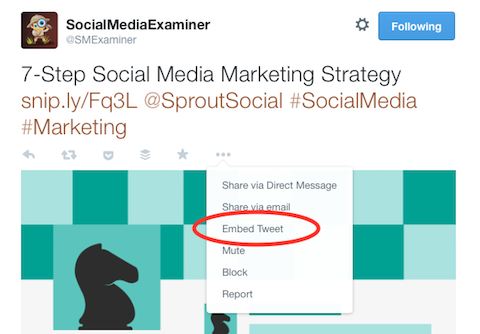 In addition to embedding YouTube, Instagram or Vine videos, you can embed video posts from Twitter and Facebook. Embedding video in social posts is a powerful way to include video in your blog content while also improving engagement on social channels. To embed a video post from Facebook, click the arrow at the top right of the post and then choose Embed Post. Choose Embed Post from the drop-down menu. 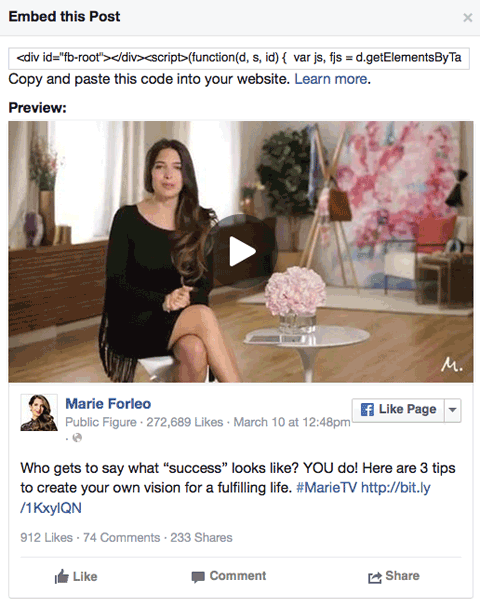 Facebook displays the video post’s embed code, which you can copy and paste the code into your web page or blog post. Copy and paste the code into your web page or blog post. 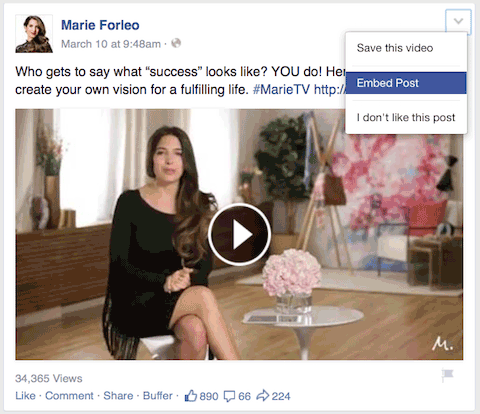 By embedding the Facebook post, people can view the video without leaving your blog post. Users can like your page and engage with the post from there, adding new life to that post. Note: Facebook has announced you can now embed Facebook videos directly into your website or blog; go to this page to learn more. You can also embed a tweet with video, a picture or text. If you embed a tweet with video, people can watch the embedded video, follow your Twitter account and reply, retweet or favorite that tweet directly from your blog post. Select the Embed Tweet option from this drop-down menu. Video significantly increases engagement and sharing on social media. 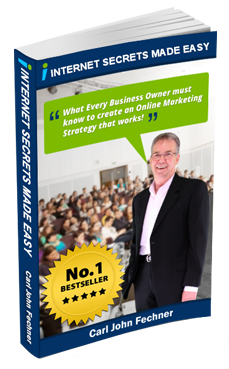 I hope that you’ve discovered some new ways to use video in your online marketing strategy. What do you think? Have you used any of these video strategies for your business? Has this helped your social media marketing? What tactics have been most successful for you? Please share your thoughts in the comments below.